The 5-a-side team from the Smelter, winners of the BOC cup. Left to right: Dunky Sinclair, Alan Black, ?, ?, Davie Eskine, Dougie MacIldowie, Graham Reynolds, Alistair Wilson, Fraser, Christie Reid. Anyone know who is presenting the trophies? 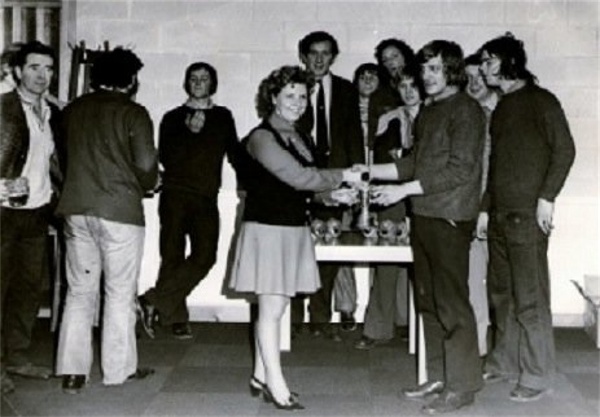 It looks like Thelma Mitchell from Alness presenting the trophies and I think the venue is the Averon Centre. Thanks Eddie - Thelma Mitchell is on picture #925 which is dated as 1956. Going by these dates I am not too sure that it is Thelma presenting these photos in 1970, but it could be.